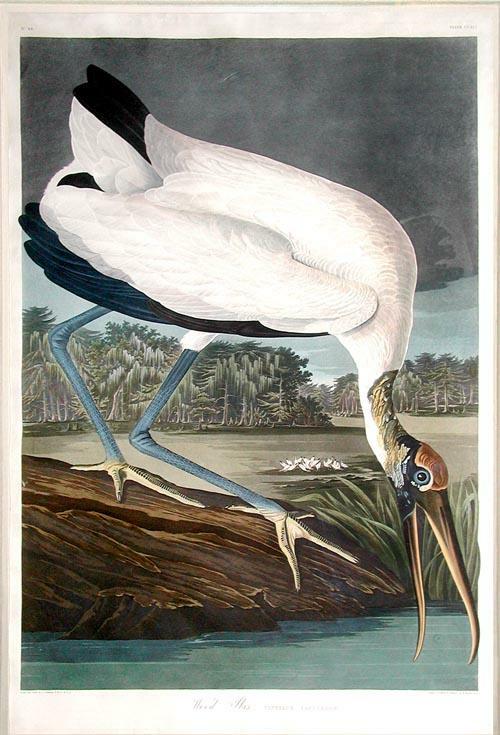 Graham Arader: Audubon Print of the Day: The Wood Ibis. Audubon, John James. Audubon Print of the Day: The Wood Ibis. Audubon, John James. Approximate plate size: 39" x 261/2"
Approximate frame size: 491/2" x 37"
First-edition, aquatint engraving with original hand-color Published in London between 1827 and 1838 by Robert Havell, Jr. In his image of the Wood Ibis - actually a stork, the only true stork native to America - Audubon captures the evocative southern landscape to which it is native. He places the looming bird in the foreground of its swampy secluded habitat, in a manner that is simultaneously monumental and charming. The bird seems to stretch to the confines of the page as it leans down into the water, large and awkward, yet oddly majestic. Audubon said of this mysterious bird, "Talk to me of the stupidity of birds, of the dullness of the Wood Ibis! Say it is fearless, easily approached, and easily shot. I listen, but it is merely through courtesy; for I have so repeatedly watched its movements, in all kinds of circumstances, that I am quite convinced we have not in the United States a more shy, wary, and vigilant bird than the Wood Ibis." Audubon accordingly imbued his "Wood Ibis" with a palpable sense of dignity and character, creating one of his most memorable images.